^ "Activities of the Member States - Ukraine". United Nations. Retrieved 2011-01-17. ^ Compare: Magocsi, Paul Robert (2010) . "Post-Stalinist Soviet Ukraine". A History of Ukraine: The Land and Its Peoples (2 ed.). Toronto: University of Toronto Press. p. 706. ISBN 9781442610217. Retrieved 2018-11-09. [...] the Soviet Union launched an intensive nuclear power program in the 1970s. This resulted in the construction in Soviet Ukraine of four nuclear power plants - near Chernobyl' (1979), at Kuznetsovs'k north of Rivne (1979), at Konstantynivka north of Mykolaiv (1982) and at Enerhodar on the Kakhovka Reservoir (1984) - and in plans for four more plants by the end of the decade. As a result of these efforts, Soviet Ukraine had clearly developed diverse sources of energy for its expanded industrial infrastructure during the six Five-Year Plans that were carried out between 1955 and 1985. "Governments of the Ukrainian Soviet Socialist Republic". Government portal. Retrieved 2008-06-11. 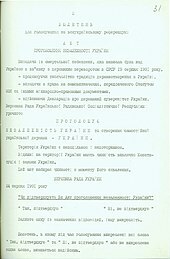 "Constitution of the Ukrainian Soviet Socialist Republic". Verkhovna Rada of Ukraine (in Ukrainian). 1978. Retrieved 2008-06-11. Oleksandr Oleksandrovych Moroz is a Ukrainian politician. He was the Speaker of Verkhovna Rada (parliament) of Ukraine twice: July 2006 to September 2007, and previously in 1994 through 1998. Moroz is one of the founders and leader of the Socialist Party of Ukraine, which was an influential political party in Ukraine. Moroz lost Parliamentary representation when the Socialist Party of Ukraine failed to secure sufficient number of votes (2.86%) in the 2007 snap election falling 0.14% short of the 3% election threshold. The Central Council of Ukraine was the All-Ukrainian council that united the political, public, cultural and professional organizations of the Ukrainian People's Republic. After the All-Ukrainian National Congress, the Council became the revolutionary parliament in the interbellum lasting until the Ukrainian-Soviet War. Volodymyr Zatonsky was a Soviet politician, Communist Party activist, and member of the Ukrainian SSR Academy of Sciences. Petro Yukhymovych Shelest was the First Secretary of the Communist party in the Ukrainian Soviet Socialist Republic, a member of the Politburo of the Communist Party of the Soviet Union and a deputy of the Verkhovna Rada of the Ukrainian SSR. Mykola Oleksiyovych Skrypnyk was a Ukrainian Bolshevik leader who was a proponent of the Ukrainian Republic's independence, and led the cultural Ukrainization effort in Soviet Ukraine. When the policy was reversed and he was removed from his position, he committed suicide rather than be forced to recant his policies in a show trial. He also was the Head of the Ukrainian People's Commissariat, the post of the today's Prime-Minister. Volodymyr Makeyenko, is a Ukrainian politician. From 25 January 2014 to 7 March 2014, he was head of the Kiev City State Administration. 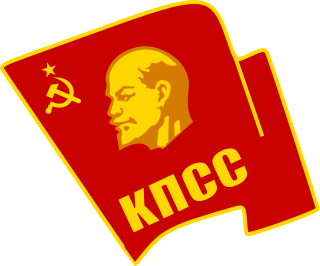 During its existence from 1919 to 1991, the Ukrainian Soviet Socialist Republic consisted of many administrative divisions. Itself part of the highly centralized Soviet Union, sub-national divisions in the Ukrainian SSR were subordinate to higher executive authorities and derived their power from them. Throughout the Ukrainian SSR's history, other national subdivisions were established in the republic, including guberniyas and okrugs, before finally being reorganized into their present structure as oblasts. At the time of the Ukrainian SSR's independence from the Soviet Union, the country was composed of 25 oblasts (provinces) and two cities with special status, Kiev, the capital, and Sevastopol, respectively.